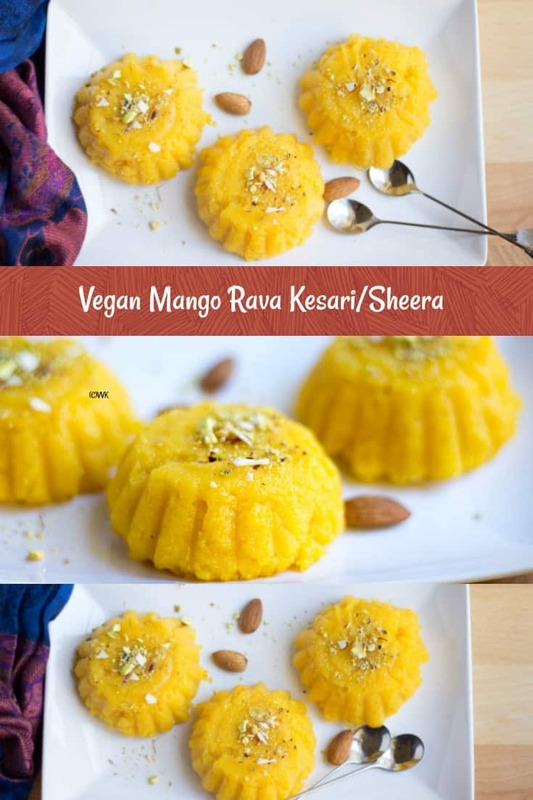 The third vegan dessert that I am going to share is the Vegan Mango Kesari or Sheera. I did not use any oil/vegan butter or margarine for this recipe, and I prepared this zero oil Kesari in the microwave. Once you have the mango puree ready, you can make this dish in 3 minutes and 15 seconds in the microwave. Yes, that’s the cooking time for this recipe. Dig in further to see the step by step recipe detail. Mostly on Thursdays, I try to prepare some sweets/variety rice for Neivediyam/Offering. If I prepare rice dishes, then I make a sufficient quantity so that I can take it to the temple. I used to fast before, but with our back to back classes, it is becoming quite difficult these days. If I prepare sweets, I usually opt for the simple ones, and also I prefer lesser quantity when it comes to sweets. So microwave desserts are the best bet. I posted few microwave based desserts at IMC, and those are my regular go-to recipes. I always wanted to try kesari or sheera in the microwave and last week I decided to give it a try and never knew my very first attempt would be this successful. I did not take any pictures. As it can be prepared in less than 10 minutes, I tried again the very next day and captured the images, and here it is on my blog now. This quantity serves three people and also as it is with no oil, try to serve when it warm. If you are storing it overnight, add a little water or any non-dairy milk and microwave again for 30 to 35 seconds. 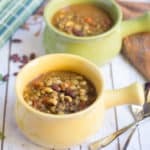 I did not use any non-dairy milk for this recipe as well. 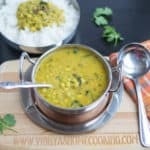 If you are preparing this as a non-vegan version, you can always add milk and ghee. 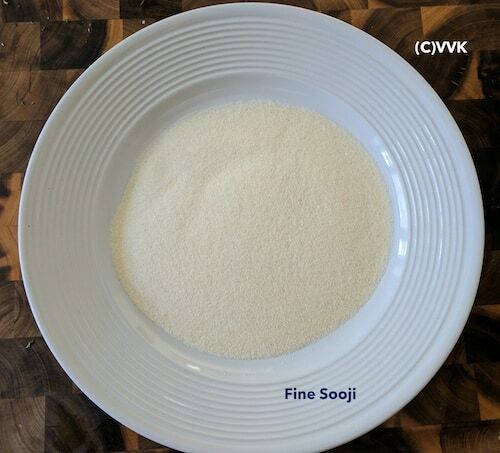 Fine Sooji works well for this recipe, and also I used only 2 tbsps of sugar. You substitute with nectars and make it a diabetic-friendly sweet too. 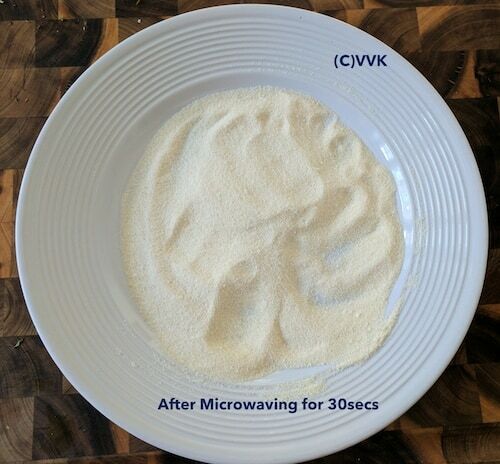 In a safe microwave plate, spread the rava and microwave it for 30 seconds. 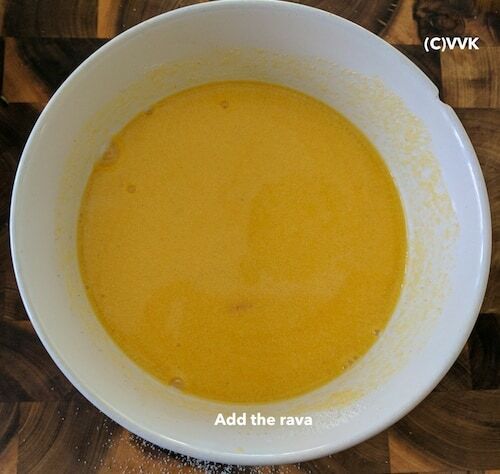 After 30 seconds, mix it well so that the rava doesn’t form into lumps. Then in a microwave safe bowl, add the ¾ cup of water and microwave for 1 minute. Carefully remove it from the microwave after a minute, and mix it once. Then add the Elaichi powder, saffron, mango essence and the mango puree. 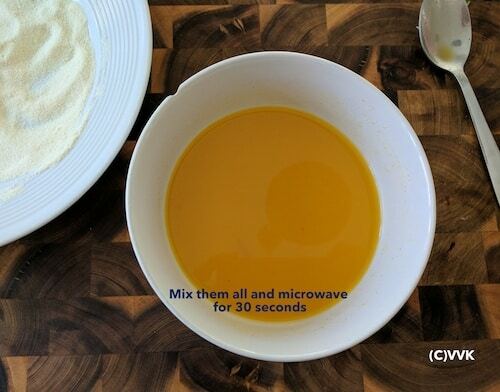 Mix them all together and microwave for 30 seconds. After 30 seconds, carefully remove it and mix it once. Then slowly add the rava. 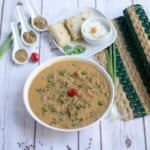 Make sure you are stirring while adding the rava. 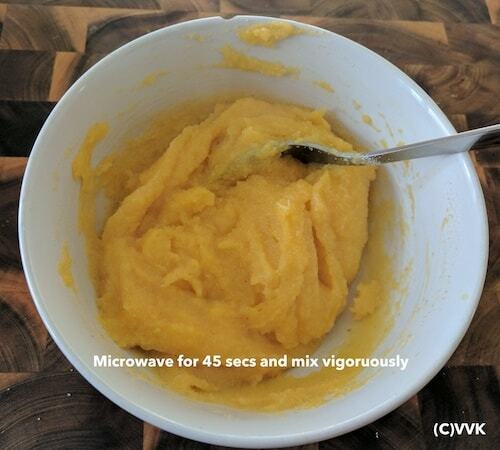 Microwave this rava mix for 45 seconds. Remove it from the microwave and stir it vigorously so that no lumps are formed. Finally, add the two tbsps. of sugar and stir it again. 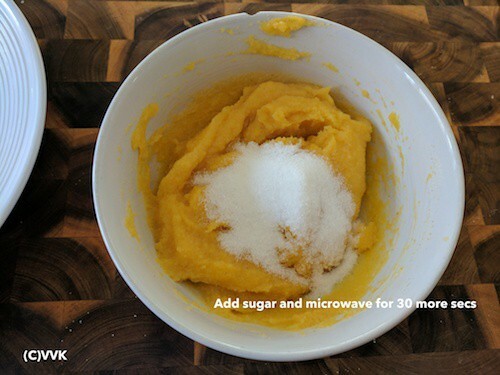 Microwave this sugar added rava mix for 30 seconds, and that’s it. The time varies depending upon the Microwave setting. So the time varies as per your settings. I would recommend always starting with 30 seconds of cooking and cook more if required. The final mix might look semi-solid, but as it cools down the kesari thickens. My mango puree was super sweet, so went with only 2 tbsps of sugar. Adjust according to your taste preference. The mango essence is entirely optional. 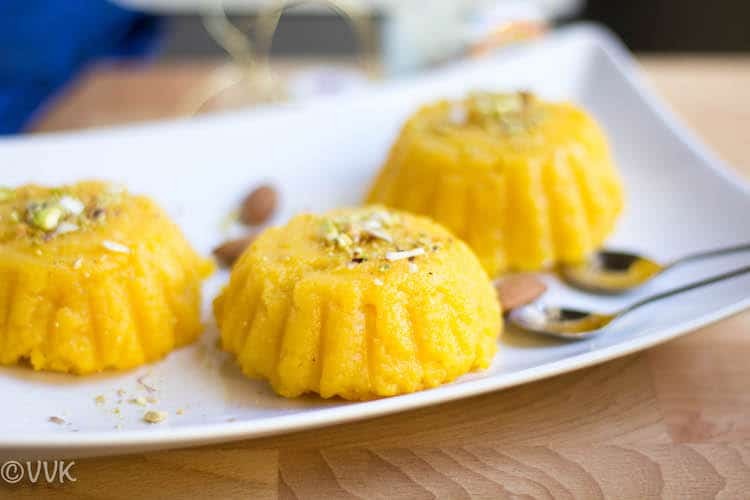 If you want to prepare plain kesari, skip the mango puree and add 1 cup of water instead of a ¾ cup and add kesari powder and your favorite fruit essence for the color and flavor. 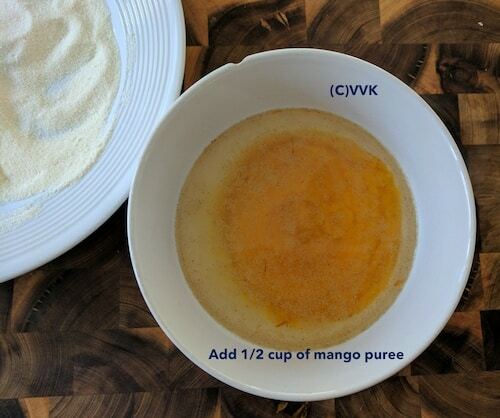 Or you can add ¼ cup of non-dairy milk like almond milk or cashew milk instead of mango puree. Serve this kesari warm, if it’s cooled down, add a little water or any non-dairy milk and microwave again for 30 to 35 seconds before serving. A vegan no oil mango flavored sweet relish prepared with fine semolina in the microwave. Mix it once. 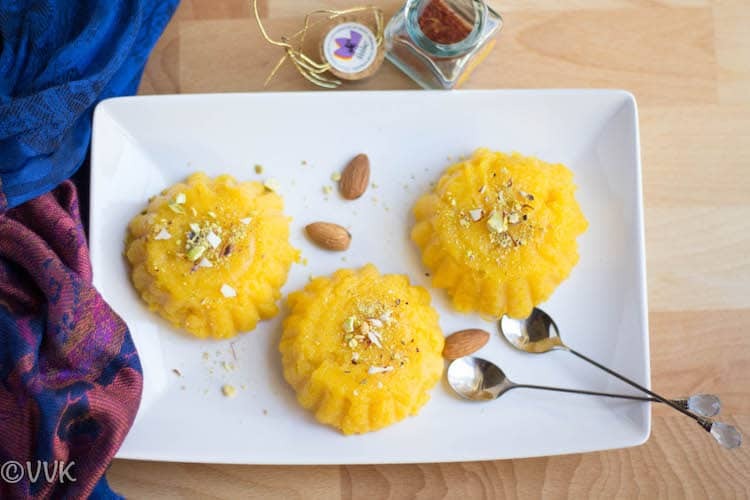 Serve this kesari warm topped with nuts or mango slices. Serve this kesari warm, if it's cooled down, add a little water or any non-dairy milk and microwave again for 30 to 35 seconds before serving. I want a slice of this delightful kesari, anything with mango goes directly to my favourite list, delicious dessert. Same here. Anything with mango, I am all up for it. Interesting and quick to make in the mw. Wow! I love it, The entire thing is so deliciously made. Love it. 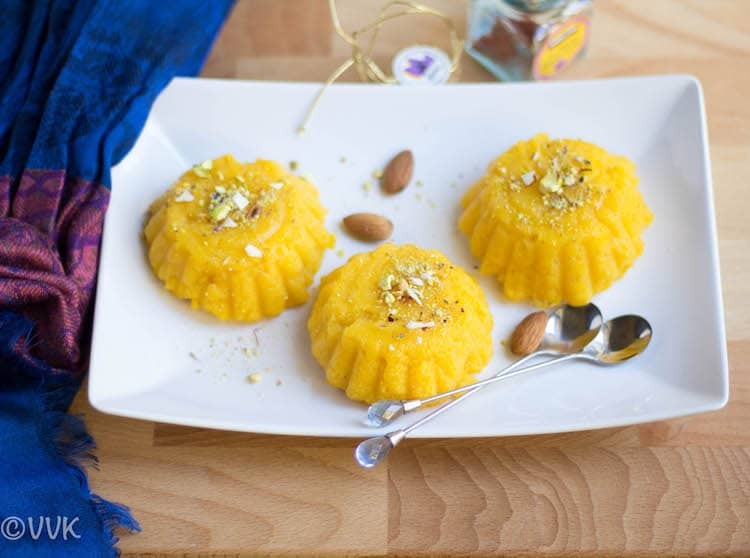 fab pudding – anything with mango is always so inviting! Rawa Keshari has been in my to do list for a long while now. Your quick version has tempted me to try it soon.. Thanks Jyoti. Please do try. Yummy looking colorful keerai,i often prepare it in MW.Its makes the work so much easy. I too prepare the MW ones… Perfect during those busy mornings. Thanks Nalini. 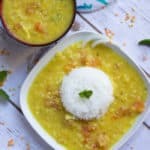 delicious looking mango Kesari. I’ve never made any sweets in a microwave oven. 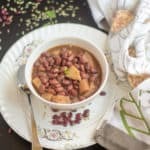 I love this recipe as its quick and healthy. MW is a blessing ! Since the past 2 years I do not use a MW , and it is when I see such dishes I miss it . 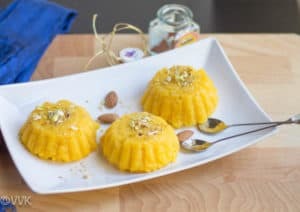 The mango flavoured halwa looks tempting specially vegan version . Super! 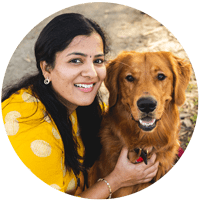 Thanks a lot Vaishali. Yeah I agree. MW is such a blessing for sure. Yes I love microwave dishes as they are so quick to get done..you have plated the kesari so beautifully!